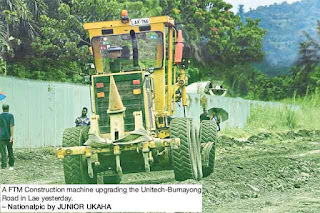 MOTORISTS in Lae using the Unitech-Bumayong Road breathed a sigh of relief yesterday as the district sent in a contactor to fix that deteriorated section. The 4km stretch in poor condition has not been maintained by successive governments. The road serves important institutions like the University of Technology, Joint Services College, Igam Engineering Battalion Barracks, Tent City Police Station, Telikom College and Bumayong Secondary School. FTM Construction went to the area yesterday and used their machines to grade and fix the uneven surface and numerous potholes. Morobe Works manager Kingsford Kassen told The National that the district paid the contractor to have the road upgraded. “This is not a national government-funded road upgrading work,” Kassen said. 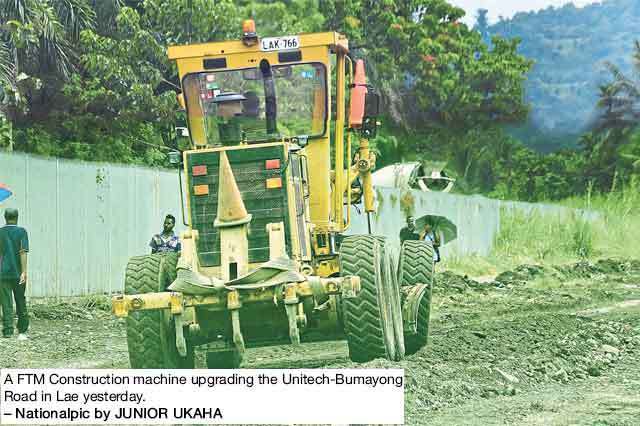 “I was informed that Lae district has given some money to the contractor to fix up the road. Kassen said the government was aware of the condition of that road and funding would be made available to have it fixed next year. Kassen said he was yet to confirm how much would be allocated for that road and the date for the funds to be released.